I was so excited when this book was announced. Kiera Cass is a favorite author of mine due to her Selection series. But then I actually read the book. I should’ve known I would be let down. In the past, when I have read books about sirens, they don’t live up to the description or expectations set. Kahlen is a whiny brat and I hated her. She has been with the Ocean for 80 years, serving her sentence for being saved from drowning, but she isn’t happy. She has “sisters” that the Ocean has also saved, but they aren’t like her- they are out-going, and one of them, Elizabeth (yes I was excited that my name was used) even goes to clubs and goes home with guys. But Kahlen sits under a tree drawing, or in the library, researched all the people she has ever killed… because you know, she’s a siren and serenades people to death. Kahlen meets Akinli, and it’s like the sun has finally broken through the gray clouds. They meet three times and she falls in the love with him. I hate this. They have no relationship to build on, and this insta-love is an insta-hate for me. Did I mention that Kahlen can’t speak to Akinli or else he’ll die? So yeah, no relationship, little dialogue. How is it possible for them to fall in love, especially Akinli. If a girl kept running away from me… I would have given up on her and told her to get away from me. This book is unrealistic (for a fantasy novel), in that these two characters know nothing about each other, barely speak, and only meet for a total of 4 times that span from a few minutes to barely a single day in the matter of almost 2 years. And how the end happens, it’s insensible. This book doesn’t have enough of a plot for me to want to keep reading, though as I waded my way through, I hoped that somewhere, a plot would form. Set your expectations at zero. This book is a mess. **EDIT** I just recently saw that this book is a #1 New York Times Young Adult Hardcover best seller. I am very upset by this. It does not deserve this award. There are so many better books than this. How about numbers 3. Passenger by Alexandra Bracken, 4. Red Queen by Victoria Aveyard, and 5. Six of Crows by Leigh Bardugo (This is as of February 7th). I hope this books falls off the face of the planet (End rant). I bought this book when it was self published years ago, but never got around to it. I love The Selection series, but I’ve heard a lot of people who have the same opinion as you about Siren. I had no idea Cass self-published this novel and I am not sure why a publishing company would publish it. It was not put together very well. And the plot was minuscule at best. I tried this awhile ago, too, when it was self-published and didn’t make it very far at all. I just was not the least bit interested. I feel like it could’ve been a really good story if she had put more thought or plot into it. More time with Akinli, like weeks or months. Built the relationship so that he finds out what she is and has to decide if he can still love her. Less whining. Less sisters. I have to admit, I’m not really excited for this book. For one, I’m kind of angry by how they’re selling it as a “new book”, when in reality, it was first published in 2009, which makes the author’s debut novel. 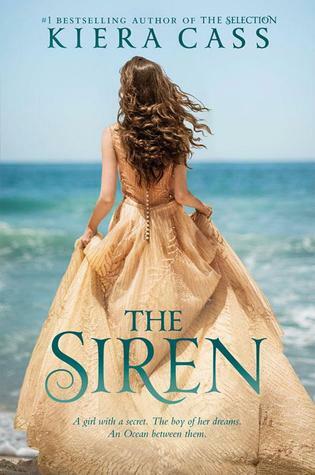 Don’t get me wrong, there’s nothing wrong with republishing a debut with a new cover, but I feel like they’re totally trying to fool us all Next to that, like you, I’ve been burnt by many books about sirens. Anyhow, I’m probably still going to read it, because THAT COVER IS SOO GORGEOUS lol. The cover got me too! I LOVE the cover. It’s so pretty. But don’t let it fool you! A beautiful cover can’t make up for a lousy story. I was probably a bit too harsh when I wrote this, but I was so let down. I also didn’t know it was self-published and her first novel. I feel like they just stuck a new cover and were like “hmmm, yeah we can get away with this” because that is one of the things that attracted me to this novel. But it was a let down, all the way around.